Nurse on the phone to Richard: Take her to Stanford ER. Richard: I think you should go. Me, barfing repeatedly a little later: Let’s go. Woke up sick, y’know, the ordinary germy type. Hoping hard I wasn’t contagious Saturday. Or yesterday, for that matter. 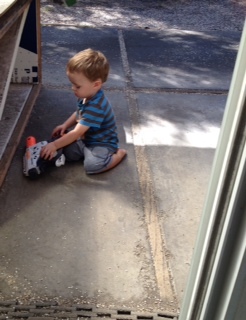 And one more photo: Hudson found the squirt gun and ran to it. Now, they don’t make’em like they used to, not at all–the powerful zappers from my kids’ childhoods were probably lawyered off the market. But the thing does squirt. Mildly. As in, perfect for his age group. He intuited without being told that one sprays the water outside, not in, and when it was all empty he brought it to me for a refill–with a word and a try and almost a two-word sentence, along with lifting it towards me, it was a Here, Grandma, you’re the one who knows how to fix this. How did he know it was mine? Indeed I do, little guy, indeed I do. 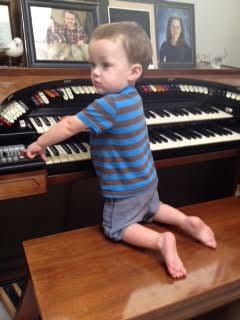 Hudson went straight for the organ. Parker went straight to the new digger toy his Grampa had bought a few days earlier and had set free from its packaging, battery in and ready to go so it would make a nice growly rrrrrrrr rrrrrrrr rrrrrrrrr. Grampa had it set on the floor not in but in front of the toy basket: couldn’t get any closer to neon signs with PARKER!!! written all over them. They only had a few minutes–there was so much family get-together stuff going on this weekend on my daughter-in-law’s side of the family, and rightfully so: you only die once. Her Grandpa John, who’d lived maybe a mile from us, had slipped quietly away in a good old age, a life well lived. I sent off a photo from the kids’ wedding of him bent way down and a small child happily high-fiving him. The kids were here a month ago while he was in hospice care and I told them, remembering my own childhood, It may surprise you how much Parker might remember of seeing his great-grandpa. We got some Dr. Seuss time in, Parker and me and then Hudson climbing up so as not to miss a thing. Fox in, what else in a knitter’s house, Sox. I had been saving two last Fuji apples, expecting they would not become overripe and they didn’t, twins growing on opposite sides of a limb, the longest any had ever been able to last critter-free in our yard. I clipped the tape on the clamshells–two layers–and as they fell, lifted Parker up so he could reach. An enthusiastic snap! Snap! and they were off! Ripe, sweet, the seeds inside brown and mature now. Parker doesn’t love having his picture taken, but just before I sliced those up I asked him if I could take a picture of the apples. He thought that was a great idea. He held them out high so I could get a good shot. I handed out slices, and when my son, playing the piano, didn’t get to his and hadn’t eaten one from the first apple either, Parker felt it his work and fair game and he’d waited, too. But you do not let such treasures go to waste. He pulled it off the music book on top of the piano and, with a nod and no complaint from his daddy, devoured it. A few minutes later, he surprised me with a big hug from behind and then ran away to tease me; Hudson gave me a hug from in front, and we all walked together to the curb and waved goodbye goodbye bye bye as our son snapped them into their carseats and finally away. I was 31. They did tell me cerebral vasculitis. Nothing at all to compare to what this woman went through, but at the same time so many parts of her story sound so familiar. It helped clinch my lupus diagnosis. Read what Christine Hyung-Oak Lee can write now. She’s amazing. Today is my sister’s birthday, and what she wanted was a photo of the house we grew up in. Hey Marian, there’s one here I missed, of looking down the street from the house, and further down in that post, one of the back yard. And just for fun here’s a memory of the DMV in Maryland. The photo here is of the C&O Canal, early November ’08. I used to walk there with my friends all the time, growing up; when Richard wanted to take me there for a walk and a picnic on our second date I knew he was a keeper. A side note. Alaska went through a 9.1 earthquake in 1964, the second highest magnitude ever recorded and that lasted about a minute. So did today’s 6.2 near Anchorage, and I’m guessing that’s a good part of why my daughter’s building at work was on rollers. She gave me a quick heads-up that everybody there was fine, even if being on the seventh floor was…entertaining? My thanks to people who build’em right. It looked fabulous when Gwyn was done, and, having caught up a bit–I’ve known her since she was born–we gave each other a hug and I asked her to please never ever move away. She laughed. No immediate plans to, thanks. No longer does my hair pin me for that nanosecond while I quickly (oh right, here you go) lean forward in the driver’s seat to release it so that I can look in my side view mirror. That’s where I tend to say okay, we’re done here: cut! Thursday, Friday, Saturday, and Sunday evenings I was not home to do my usual watering but for just long enough to keep the pots of tomato plants going and I was off. There was a one-plant surprise party for me Monday way across the yard over next to the cherry tree: having weeded there last Wednesday, I know it wasn’t there then. Okay, then, squirrels do bury food for the winter, but squirrels don’t even like tomatoes–they just steal the juices out and toss the rest. Curious little mystery. It’s a vigorous little grower, maybe we’ll even get a harvest out of it. Meantime, thinking about yesterday’s post some more, I realized that I have no idea what time my car actually got done and my showing up to ask might have been right as they finished. In my hurry to finish the post and call it a night I neglected to mention that the mechanic had asked me for my cell number so he could tell me when it was done. I explained the hearing impairment (I’d forgotten my bluetooth pendant to my Iphone) and that in that noisy store, I would never hear it ring; I asked if it would be possible to text instead? Now, we have a cell plan with unlimited free texting, which they don’t offer anymore; we’re grandfathered in, along with two of our kids and my parents. This guy probably pays by the text and he was willing to offer that out of his own personal pocket to a customer. He didn’t have to do that–and in the moment that he did, there was a certain joy in his face in the offering. They’ve got a good guy there. I got two notes back from Costco customer service this evening. The first was an automated, we don’t answer after hours but we will get back to you tomorrow. The second, sent soon after by someone who had read it anyway and clearly had felt compelled to answer, was a note thanking me and saying they would forward my email to the manager so that Luis could get the recognition he deserved. And now I was the one who was smiling. May that little moment he created not be buried but come to full fruition for him. It is supposed to rain come Thursday, a whole .12 of an inch, but still, actually measurable rain as opposed to last week’s random scattered few drops that couldn’t even clean a skylight. The first of the season in California always brings a string of accidents from all the months of accumulated oil on the roads as the surfaces all go slick in a way they will not after a good washing-away, an annual phenomenon I’d never heard of till we moved here. It was time. The new tires went on today. The mechanics forgot to tell me my car was done. I was in no hurry to walk outside and risk the UV exposure, so having commandeered a padded chair I found inside next to the photo lab I simply sat. And knit. And watched the reactions of passersby to the randomness of a woman knitting at Costco. The photolab guy kind of sneered and silently but clearly wished me out of there. One woman made up for that when she stopped midstep at the sight of my needles: she looked thrilled, and almost, almost struck up a conversation. I would have myself but I let her decide at her own comfort level, wondering if there was a language barrier–but I would have told her that really, there was not. Her face lighting up like that had said what I’d needed and I wanted to tell her thank you. So I smiled greatly in return. I knitted on. That purple scarf for my cousin I’d been meaning to really get going on? Now I have. 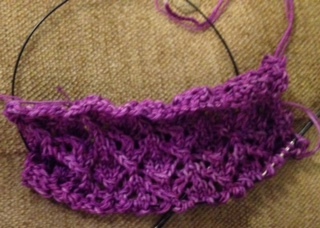 I really like how it’s coming out, which is when a project about knits itself, y’know? When my hands needed a break after two and a half hours I finally did get up and go back outside and in the other door to ask after that car. Oh, right, here’s your key! And so one sense of satisfaction at a needed job getting done became closer to two. (Edited to add the next day: when it got past 5:00 I saw my chance at redeeming the interaction between me and the photo lab guy. I asked him what time the tire center closed up for the night, I mean, y’know, I hadn’t missed…? She stopped me right there: No no she LOVED the bluegreen in the one she got, it was perfect! It could *never* be better than that one. She has no idea how much she gave me. Again. 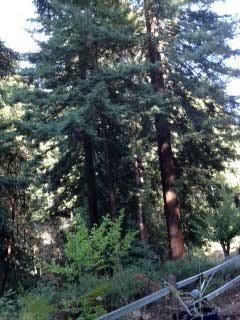 An impromptu get-together of cousins at Richard’s aunt’s this afternoon up in the redwoods in the mountains. I think that’s her cherry tree in front on the right, for perspective on size. And then back downhill for a brief stop and then back up into the mountains going in the opposite direction to celebrate a friend’s milestone birthday. Where we ran into friends we hadn’t seen in years, properly celebrated the birthday boy, and a grand time was had by all. One of those, wow, we squeezed a whole lot of living into one single day and wow is it late. Oh and: I tucked a cowl I’d knitted into my purse, having felt that I should be ready to give–someone, no idea who–something from my needles tonight. Okay, then; I was ready for whoever it should turn out to be, since I was definitely going to see a lot of people. Madeline Tosh blue/green handdyed softness, my Ft. Worth yarn bought from the MadTosh owner herself. It just didn’t… I wondered at first and then I simply forgot about it. Didn’t even think of it. It stayed tucked away. Which is fine, but, huh. We had to stop at the grocery store on the way home, one last thing to do today because we’re having company over for dinner tomorrow, and there we ran into a friend. She and her family are new in the area, here on Sabbatical from one university to another; we had hit it off with them right away and they’ve borrowed a few items they didn’t have in their temporary place. You need to know what the temperature of something is, here, use our laser thermometer, glad we could help. Your son needs to weigh things by the gram for a school project, so do I because of my knitting–here, use my scale, c’mon over. Guess who loves that shade of bluegreen? She was so absolutely thrilled, the kind of reaction that makes it so many many more projects will get made in happy anticipation of the next moment like that. And a new and strange town got a little more like home. I always thought having a hyperactive immune system with no sense of direction ought to be useful for fighting off cells that actually shouldn’t be there. Say, cancer. I needed a stuff-in-my-purse project. So to my cousin Wendy, should she happen to see this, I finally finally got the right yarn and got started: purple she wanted, purple it is! Still wishing for Malabrigo Rios in that colorway. …Besides, it wasn’t up against the fence like the others were. You know what I was thinking yesterday? I was thinking I needed a good hawk sighting. It had been awhile and I just really needed one. Well, so do something about it. And so I filled the second feeder, which I haven’t done much lately; seed in the summer can add up. But it does bring the birds closer in towards the house. Three finches made a wild scramble off that thing this afternoon and I looked up. Coopernicus wasn’t trying to chase them. He was simply showing up. He settled down on the nearest tree branch where he could get a good view of that now-prey-free feeder–but also of me. I communed, he perhaps tolerated, but he was there, watching, considering me and my presence below. I wondered if it was even the same male I had known across these years or if it was his offspring. Hard to know from the distance, but by the behavior, I would say it was him and by the size, definitely male. I radiated all the love I could in thanks, hoping it would somehow make him want to visit more often, and he stayed there looking back at me for several wonderful minutes. If it was Coopernicus I could have swiveled my gaze to a spot where a finch was hiding in the elephant ear leaves and he would have understood and followed and gone to it if he was hungry–he’s done that before–but there was none; they’d all gotten away safely, and if he’d been hungry he would have followed them in the first place rather than coming to me. I felt like all I’d done was give him a half-reason to. And then having done what I’d asked for, he showed great finery of tail and wing at last and was off to his own matters. I sent off a card to Cliff, Don’s son, several weeks ago. He took such good care of his dad; we should all be so well loved in our old age. I knew that Don had lived in a senior community and I wondered how that works when a not-yet-55-year-0ld inherits the place. I also know that sometimes when you’re grieving a loss, often people tend to assume a few months later that life has gone back to normal and that they shouldn’t remind you of your missing loved one and reignite any pain. As if you could forget. As if you didn’t remember every day. And so, me, I try to send out an ‘I’m thinking of you’ later on as well. Today it came back to me weeks after I’d sent it, stamped unforwardable. He had snailmailed me letters in his dad’s final illness, giving me updates, letting me know. Very much appreciated. And now, who else would remember that day my doorbell rang and Cliff was standing there with Don grinning like crazy from the passenger side of the car out front as his son held out new pans for me to make them chocolate tortes in? Surprise! After I had complained in this space that my old pans had leaked and smoked up my oven. Or how they saved up produce clamshells to keep my fruit trees from the squirrels. It is halfway through September and I still have a few last Fuji apples ripening, safe. Cliff, if you read this, I baked tortes tonight because I was thinking of you both–grinning, remembering that day, thinking how much fun Don would have had with Sunday’s post. Thank you, and may all be well with you, wherever you are now.